Sense the temperature of the room you are in, instead of the hallway! Adjust the temperature from your armchair, kitchen table, couch, or even from your warm cozy bed! Move your thermostat anywhere in the house. Comfort and convenience like you've never had before! In addition you will find that this thermostat is affordable, easy to use, highly accurate and rapidly responds to temperature changes. 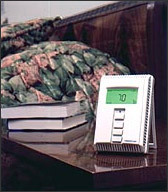 The wireless thermostat consists of two parts, a thermostat and a receiver. The receiver has the wiring connections to the unit and it can be placed wherever the wires are available; the old thermostat location, in a furnace closet, in an attic or basement, or sometimes even inside a package unit on the roof. The receiver is easy to install and is wired just like a standard 24VAC thermostat. Once the receiver is installed, the thermostat can then go anywhere in the building, and it will transmit radio signals back to the receiver. The transmission range is up to 500 feet, and it works through walls, floors, ceilings, etc. The temperature sensor is located on the thermostat, so place the thermostat where temperature control is most important to you - your bedroom, the boss's office, a baby's room, etc. Dual-setpoint with adjustable dead band (1 to 6 degrees) and temperature sensor calibration. Setpoint adjustment range from 35º to 99º F, sensing range from 32º to 99º F.
Will the wireless thermostat interfere with any other systems, like my garage door, security system, stereo, or intercom system? No, the thermostat transmits on a 417 MHz broad spectrum pulse modulating frequency, and is FCC approved. It will not interfere with other systems, and other systems will not affect the thermostat. What if my next door neighbor buys one - will it interfere with mine? The wireless thermostats have up to 64 different house codes, much like garage door openers. As long as you set your thermostat to a different code than your neighbor you will have no problem. Where can I get replacement batteries, and how will I know when to change them? There is a low battery indicator on the thermostat display to tell you when to change the batteries. The thermostat uses AA Lithium batteries (do not use alkaline) which are available at Wal-Mart, K-Mart, Home Depot, almost anywhere batteries are sold. Occasionally lithium batteries are stocked in the camera section. What if someone drops the thermostat? The thermostats are very durable and can withstand falling to the floor and most normal household abuse. If you have toddlers you may wish to mount the thermostat on the wall to avoid later finding it in the VCR or toilet. Screws are provided for wall-mounting, along with a nail-hanger slot, or you can even Velcro the thermostat to the wall. What's the difference between the commercial thermostat and the residential thermostat? The way the thermostat programs is different. 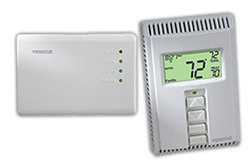 The commercial thermostat programs with an Occupied/Unoccupied type schedule, and also features multiple security levels to prevent unauthorized use. The residential thermostat programs Morning, Day, Evening, Night, which is more intuitive for a home, and includes programmable fan, Energy Watch and other special residential features. If you have difficulties or need further information, please contact info@thermostatusa.com.